Meet my new favorite chili! 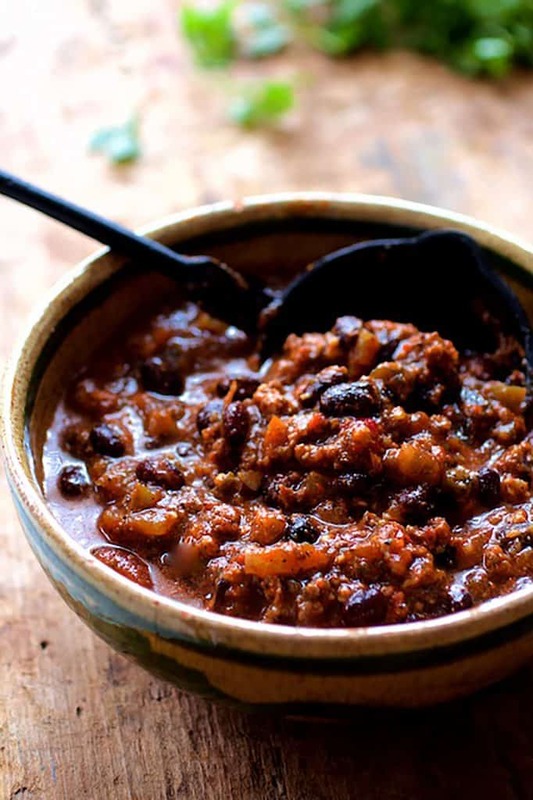 Beef and Chorizo Chili with Black Beans is scaled for a crowd and perfect for a party! I hope you’re having a wonderful holiday season, are not too insanely busy and are able to enjoy time with your family and friends. Like everyone else this time of year, there’s too much to do and not enough time to do it. I was not even sure how much Christmas decorating I really wanted to do or had time to do. It always seems like such an insurmountable job and I have a difficult time getting into the Christmas spirit every year anyway. A number of years ago, my mother was in the hospital over Christmas and eventually passed away so this time of year is always a little tough. But then, I got on a decorating roll and couldn’t stop. After a weekend of decorating, I told my husband it would be nice if someone could see my decorations. (Sniff, feels sorry for self.) Except for my stepkids and grandkids, we don’t have any other family in the area and no one was coming from the icy north to visit. We also didn’t have any parties planned, so it seemed I was only decorating for the two of us and the kids. So to fix that, we decided to have a party! My husband sent an e-mail out that night and EVERYONE on our guest list could attend on the date we specified. That hardly ever happens so I got pretty excited. Naturally, the chef in me begins planning an elegant soiree with a stunning buffet of top-notch menu items like beef tenderloin, shrimp, gorgeous appetizers, etc., etc. Upon informing my husband of the menu I was planning, I could see the potential stress (and cost) of it all immediately pass before my husband’s beautiful blue eyes. He preferred simple and casual and back down to earth I came. 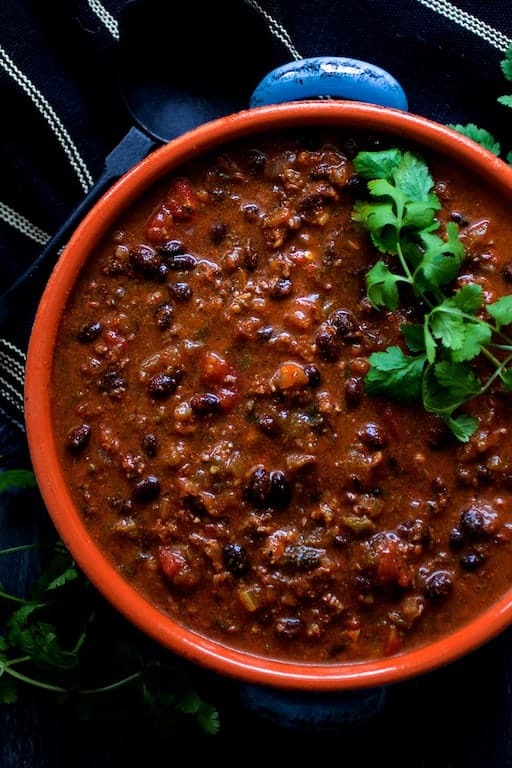 So, simple and casual it was and Beef and Chorizo Chili with Black Beans was born. The rest of the menu consisted of my Sweet and Tangy Barbecue Chicken Sliders, coleslaw for the sliders, potato skins, salad, cheese and charcuterie board. Everyone asked what they could bring and we let them do it. Some brought appetizers, some brought dessert. A good time was had by all and this chili was a hit! Now, I’m fully aware of the big beans/no-beans-in-chili debate. I like beans in chili–especially black beans. I like the texture variation beans provide to all that meat. And yes, canned beans are just fine. We’re doing simple, remember? Just be sure to drain and rinse them thoroughly before adding to the chili. This was the first time I had ever used chorizo in chili and it certainly won’t be the last! I love chorizo and it’s fast becoming one of my favorite ingredients. You’ll want to use fresh, raw Mexican chorizo. Spanish chorizo is cured and some types can be quite dry. Spanish chorizo is best served on a charcuterie board. And poblanos! Had to use poblanos since we had such a bumper crop. I had them already roasted in the freezer so all I needed to do was thaw and chop. Roast the poblanos if you have the time and ambition. 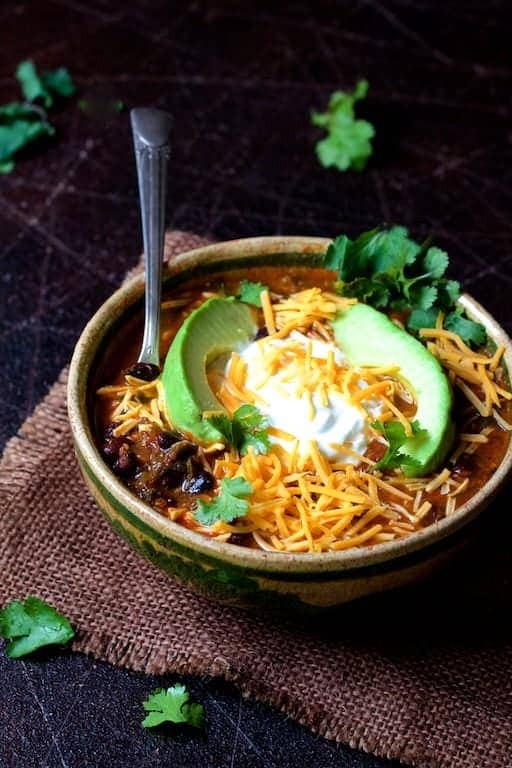 I like to roast them for another level of flavor and to get the skin off, but with all the other vibrant flavors and textures in this chili along with the lengthy cooking time, unroasted and unpeeled is just fine. I made two good-sized pots of this beef and chorizo chili. We had a total of 16 people and only one pot was consumed. We also had tons of other food so the servings everyone dished up were probably half the size they would have taken if chili was the main course with only a side dish or two. You should get about 12 hearty servings from each pot. 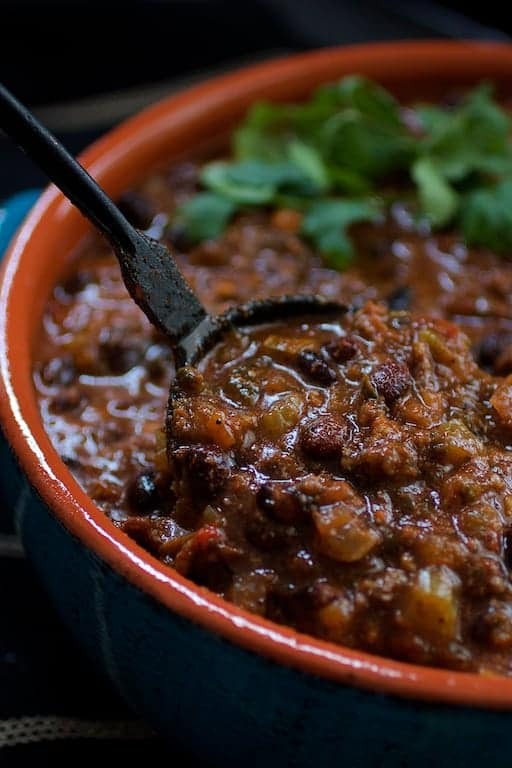 This beef and chorizo chili is perfect to make ahead of time (which is what I did). Cool thoroughly then refrigerate to allow all these lively flavors get to know one another. If serving the same day, I like to let it rest a little bit before serving. Happy Holidays, Merry Christmas, Happy New Year and all that good stuff! 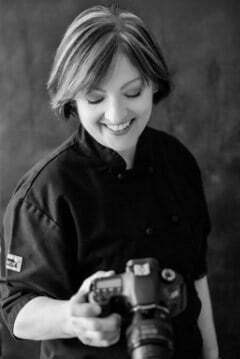 Thank you so very much for reading and following From A Chef’s Kitchen. You help make my kitchen my happy place! Scaled for a crowd and perfect for a party! If roasting and peeling the Poblanos, use eight large peppers as they shrink quite a bit. Add them in when you add the liquid ingredients. If using fresh, add fresh poblanos early in the cooking process. I have to figure out Instant Pot times for this but will try for sure! Thanks, Ella! Hope you enjoy! I haven’t done chili in an electric pressure cooker yet. I think slow-simmering gives the chili a bit more flavor intensity. Please check back and let me know how it goes! Thanks again! 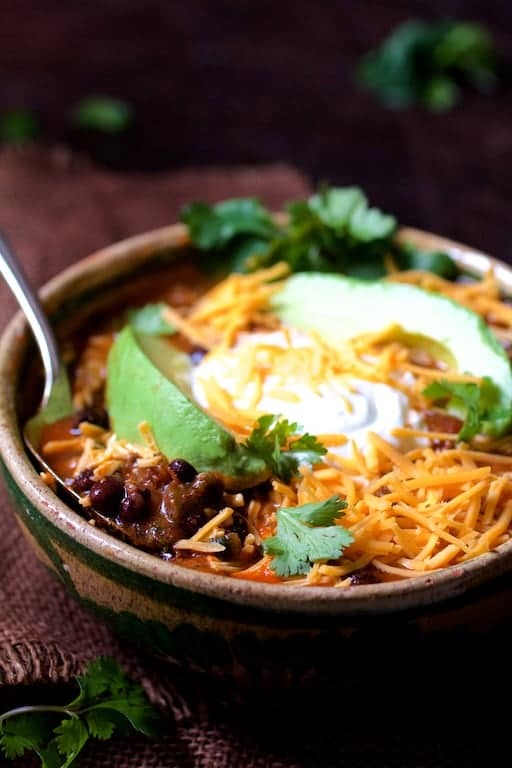 Wonderful chili recipe! It looks so delicious and comforting! This looks and sounds so amazing!! Cant wait to try it! Great photos!! Yum. This chili looks so delicious. I love the chorizo you put in it! Beautiful photos and even lovelier recipe!